Tuesday - Friday -- 9:00 a.m. - 12:00 p.m. and 1:00 p.m. - 3:00 p.m. Adult Sunday School -- 9:30 a.m.
Fellowship & Coffee -- 10:30 a.m.
Worship Service (Child care provided) -- 11:00 a.m.
"The Gathering Place for Kids" Sunday School -- 11:00 a.m.
Click here for the new 360º virtual tour of the Holly Presbyterian Church's sanctuary. Over 1,700 people have joined our church over the years, and we have had 38 pastors during that time. We remember those who have gone on to their greater reward with virtual cemeteries. These virtual cemeteries contain information regarding burial locations, often including pictures of their memorial stones, links to other family members, and even photographs in some case. There are 16 virtual cemeteries of our past members grouped alphabetically by last name: A; B; C; D-E; F; G; H; I-K; L; M; N-O; P; Q-R; S; T-V and W-Z. Women with multiple surnames (maiden name, multiple marriages, etc.) are listed in multiple virtual cemeteries as needed. There are many former members for whom we do not have burial information. If you know of any and can supply us with their memorial details, we will be happy to add them to our virtual cemetery. Please click here to send an e-mail to Jim Lyles with the information. The Holly Presbyterian Church has a rich history, which dates back to 1859, only twenty-eight years after the first white family moved into the area and twenty-three years after Ira C. Alger built a log cabin where the Mill Pond and Broad Street are today. A small group of Presbyterian families met in their homes and then the Methodist church until the Presbyterian Church building was erected in 1861 on a plot of land donated by J.B. Simonson. It was 32’ by 52’ and cost $2,200. The church was remodeled in 1879 and burned to the ground February 23, 1889 during the Sabbath School’s annual sleigh-ride. The fire was caused by a flaw in the chimney construction and resulted in not only destroying the church, but also nearly costing the life of a baby girl, Phoebe Divine. A new building, our current church sanctuary, was erected on the same spot in only 246 days after the fire. 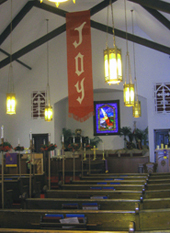 If you would like more information about the history of the Holly Presbyterian Church, we have several PDF files that you will find of interest. The first is a booklet prepared in 1959 by Isabel Stark entitled “One Hundred Years of Service.” The second is an updated history prepared by Barb Brown and entitled “Holly Presbyterian Church, A Historical Review,” which takes the church’s history through July, 2007. The third booklet is an update of the church history done in 2009 by Barb Brown for the 150th Anniversary. In addition, we have a booklet of recollections of members and pastors compiled by Jennifer Chanter. "Holly Presbyterian Church Memories, 1859 - 2009"
The 150th Anniversary Celebration Day of Holly Presbyterian Church on Sunday, July 12, 2009, was a great success! Special thanks to the 150th Celebration Committee, chaired by Judy Studer, and to so many devoted people who put in countless hours of time and effort to make this day a time of celebration and remembrance. Four of our past ministers participated in our worship service: Rev. Lou Thompson, Rev. Bill Lankton, Rev. Jack Craft, and Rev. Herb Swanson. We thank you for your service and dedication to our church and are so glad that you were able to share in this celebration with us. Also, a special thanks to bagpiper Brad Wright and composer and cellist Rose Bridges, who performed, along with Julia Belyayeva-Hull, a piece for special music that she had written for the celebration. There were several displays, including a DVD slideshow produced by Jim Lyles, and memorabilia compiled by Donna Miller, that were available for perusing during the potluck dinner following worship. You may click here for pictures of the 150th Anniversary Celebration.